pho | poor scientist. will blog 4 food. Since moving to the Bay Area, my favorite pho place has been Pho Saigon II at the Pacific East Mall in El Cerrito/Richmond. In fact, the pho there is so good that it almost always deterred me from going to the very tempting VH Noodle House just next door. The broth is flavorful but not greasy, the noodles have great chewy texture, and the meat appears to be of good quality. Recently, SB took me to her favorite pho place, Yummy Yummy in the Inner Sunset District, which she’s been raving about for years. Once the bowl came, I instantly knew why SB loves it so much: the serving size was HUGE! I enjoyed the flavor but I felt extremely overwhelmed by the quantity of noodles. For once, I actually experienced noodle overload, which made me sad. So, I think the winner for me, especially considering location/proximity, is Pho Saigon II. Combination pho at Yummy Yummy, large bowl. Barbeque beef for the DIY rolls that SB and JB ordered at Yummy Yummy. *First photo from my new camera! Look for a new page dedicated for photography soon!! Categories: noodles, photos, restaurants | Tags: Pacific East Mall, pho, San Francisco, Vietnamese | Permalink. Today, I had pho at Pho Hoa in Berkeley. I ordered my usual: regular size #5, steak with flank. Sometimes I mix it up with meatballs, but I wasn’t feeling that meatbally today, if you know what I mean. I’ve been a regular at Pho Hoa since I moved to Berkeley three years ago. And when I say regular, I mean religious, must-go-once-a-week type of behavior. Normally, I don’t like going to chain restaurants, so I was sort of upset when I found out that Pho Hoa was a franchise chain operation. But my stomach was happy, so I decided to overlook the chain aspect/my liberal guilt/snobbery and concentrate on the food, which is delicious. Sometimes I deviate from the pho and get the vermicelli salad bowls, which are also delicious and are so big that there’s enough leftover for lunch the next day. And guess what? They’re full of noodles too! Why do I prefer pho at Pho Hoa, as opposed to some of the other pho places in Berkeley? The flavor of the broth is good and not too salty, the meat and veggies always look fresh, and the noodles are not overcooked. I also like the fact that the restaurant is quite sanitary, unlike some other noodle shops I’ve frequented. In fact, the first place I experienced pho was in College Park, Maryland. My sister PY took me there, and we joked that it was called Pho 99 because the noodles were “$4.99.” It was cafeteria-style with rows of tables that you had to share with strangers. On an unlucky day, I might have sat next to a swarthy looking Vietnamese man leering at me through his rice noodle laden chopsticks. I distinctly remember one dinner which ended up being free because I found a gnat in my soup. Yeah, so compared to Pho 99, Pho Hoa is a real classy joint. 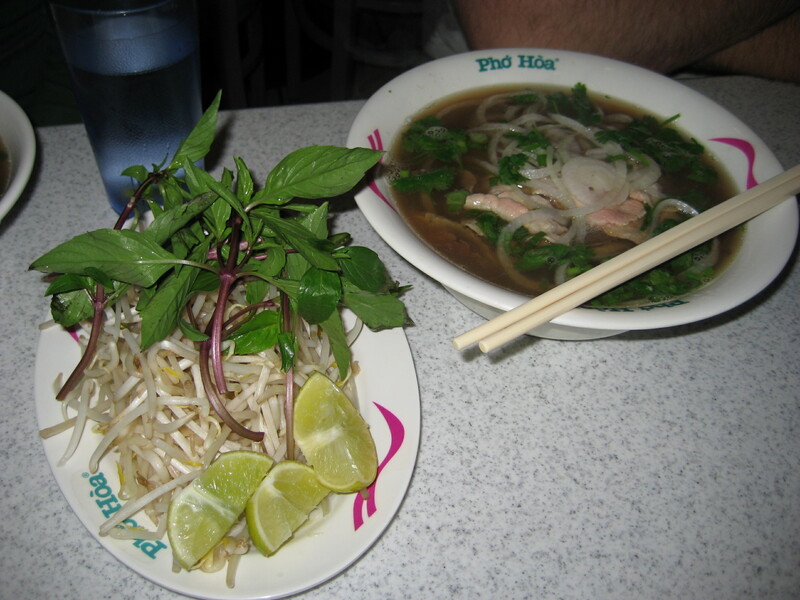 UPDATE (15 August 2010): I returned from a trip to find that Pho Hoa is now officially closed. Apparently they were hit pretty hard by the economy and were forced to close their doors. I’m very sad about this development and I will truly miss you, Pho Hoa. Categories: Berkeley restaurant, noodles, photos | Tags: noodles, pho, photos (food) | Permalink.